ATR’s quality assurance process is comprehensive and adapted to each individual project. 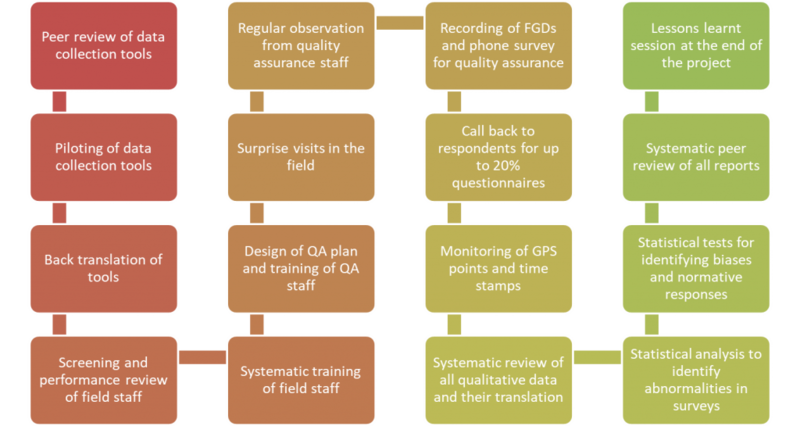 Efforts are made to mitigate risks to data quality from the outset through rigorous project design and dedicated quality assurance staff monitor the performance of qualitative and quantitative data collection from beginning to end. For field work, ATR’s Field Coordinators monitor interviews and focus group discussions through surprise visits and spot checks as well as random phone calls. ATR uses a variety of rigorous methods to verify information, scrutinizing the data collection process closely, systematically back-checking fieldworkers and re-contacting individuals to check the validity of data and discarding data that is suspect or does not meet high quality standards. ATR incorporates state-of-the-art technology into its project to increase efficiency and reliability. For example, ATR pioneered the use of mobile GPS technologies that allow for monitoring of data collection in real-time and provide time stamps and GPS coordinates for each data point collected. ATR’s expert statisticians cross-check the outputs and analysis of quantitative data to guarantee statistical validity and analytical rigor. Additionally, ATR triangulates all findings against data from trusted third-party sources.